Ready to learn how to make a quick silken tofu scramble in 10 minutes? Not a fan of rubbery tofu? Silken tofu scramble is the way to go. 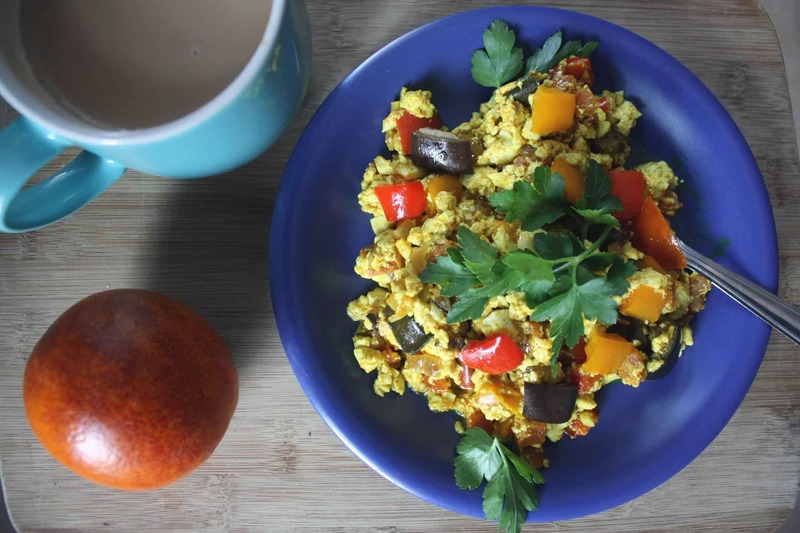 And this rainbow tofu scramble only takes around 10 minutes to make. I used to think I didn’t like tofu scramble after eating a few too many rubbery tofu scrambles in restaurants. Overcooking extra firm tofu can make it dry and rubbery. 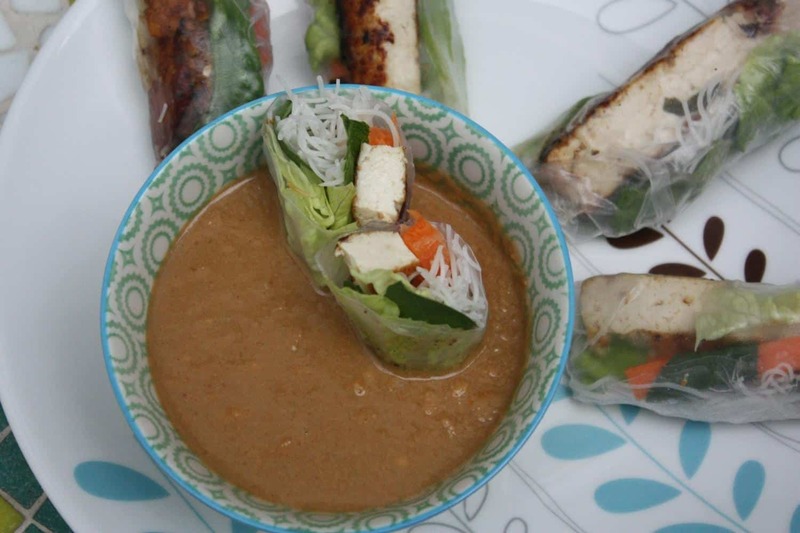 Save your regular extra firm tofu for other recipes, like these mojito-marinated tofu summer rolls! 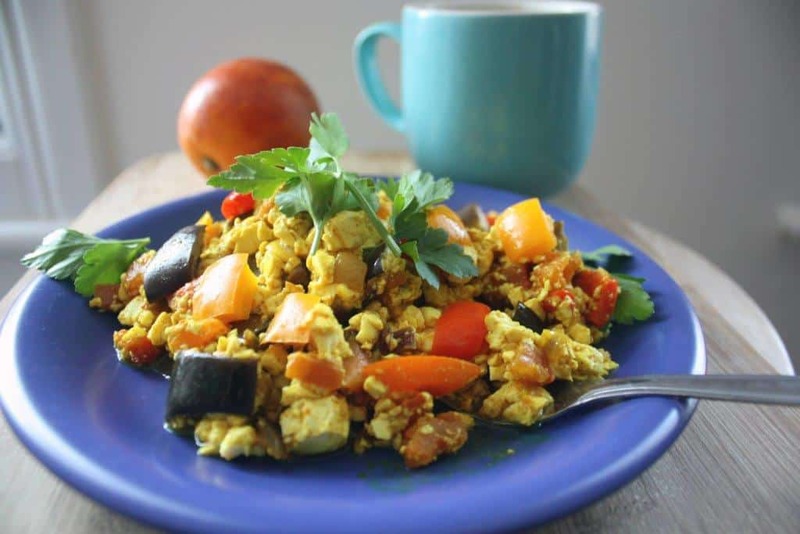 Then, I came across a recipe for vegan tofu menemen (Turkish scrambled eggs) on Serious Eats. 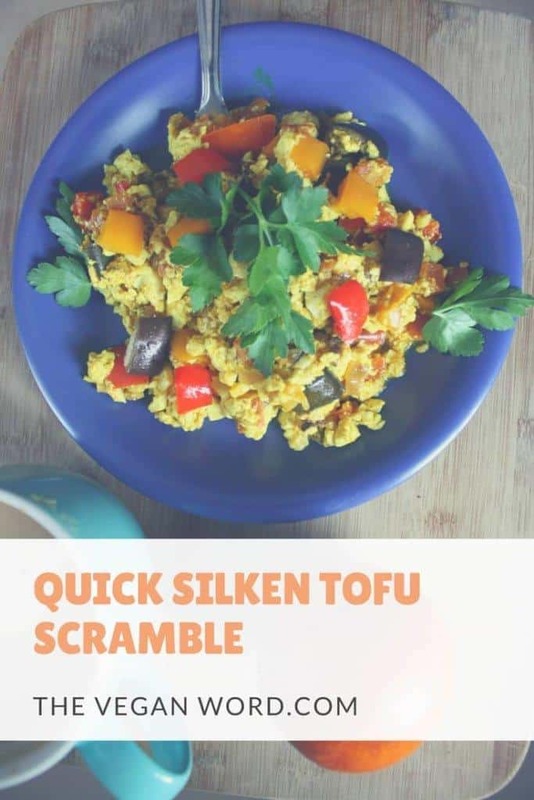 In it, the author, Kenji Lopez-Alt (who creates brilliant recipes) suggests using firm silken tofu to make smooth, silky scrambled tofu, closer in texture to a soft scrambled egg dish. 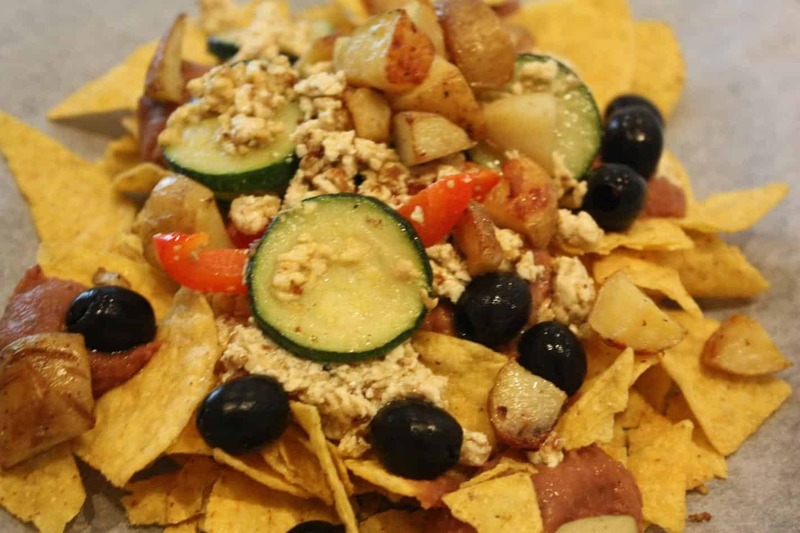 I started making silken tofu scramble and never looked back. Now, I eat silken tofu scramble at least once a week. Best of all, it stores and reheats well, so you can make a big batch at the beginning of the week and have breakfasts for several days! Black salt (tastes like egg). This miracle ingredient is commonly found in the spice section of Indian supermarkets and tastes (and smells!) like eggs. A container will last you for many months (or a year!) since you only need a little pinch at a time. If you don’t have an Indian supermarket nearby, click here to order online. Extra firm silken tofu: this has just the right texture. It can be tricky to find the extra firm one; I like this one. Click here to order online. Cuisinart 722-36H Chef’s Classic Stainless 14-Inch Open Skillet with Helper HandleFrying pan or wok (click here to read my list of Vegan Kitchen Essential Tools). I often roast a big batch of veggies one night to have in a meal or throughout the week and I love throwing leftover vegetables in my silken tofu scramble. You can use whatever leftover vegetables you have on hand (or you can leave out the veggies completely if you prefer) but I love using vegetables of different colours to create rainbow tofu scramble. Black salt adds an eggy flavour. You can buy black salt (which is actually pink, in spite of the name, and sometimes called kala namak) online here, or in an Indian supermarket. It’s inexpensive and you only need a little bit to get a big punch of eggy flavour! 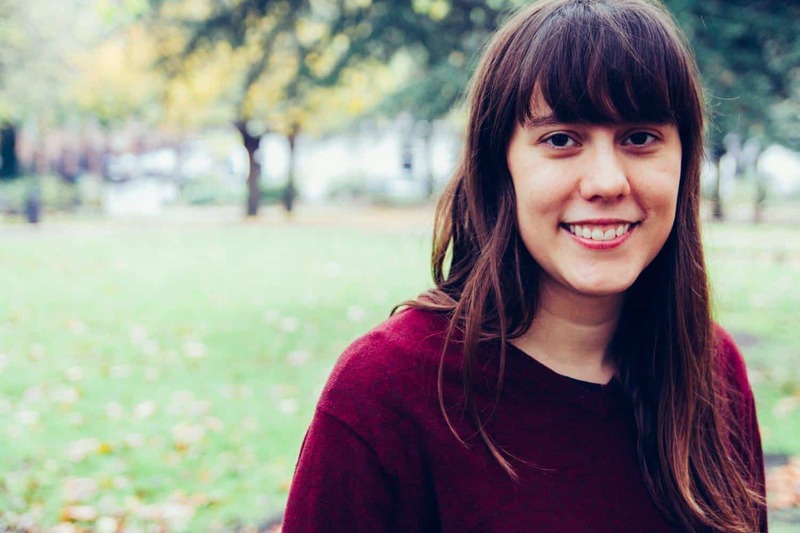 If you’re transitioning to veganism and missing eggs, it’s well worth seeking out. Saute onion and carrot (if using) in olive or vegetable oil in a frying pan until the carrots start to soften and onion begins to turn translucent. Add the garlic and saute until it begins to brown slightly. Add the chopped tomatoes, black salt and turmeric and cook until the tomatoes have softened and released their juices. Open the tofu and drain off any water. Then, crumble it into the frying pan and stir to mix with the other ingredients. Add any leftover veggies and mix everything together. Season to taste with salt and pepper and cook another minute or two, until the veggies and tofu are hot. Add more black salt if you want a stronger eggy flavour. Stores and reheats well, so store any leftovers in Tupperware and reheat before serving. If you make this dish, please share — use #theveganword on Instagram or send me your pics and tell me how it turned out! Note: There are affiliate links in this post; if you buy a product through them I’ll receive a small percentage (at no extra cost to you). As always, I only recommend products I use and love. ahhh I think I need to try this with the silken tofu! Great idea… And I have the Blue Dragon brand at my closest supermarket, lucky me :) Thanks for sharing! !